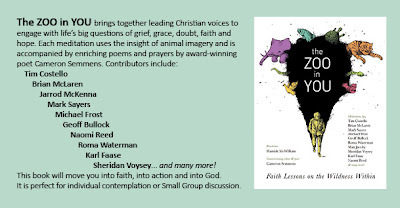 Yep, another piece is being published, this time in The Zoo in You, a book exploring the animal imagery of faith. If you can cope with a bit of God in your reading, you should love this book. Each reflection is grouped with a prayer and a poem by Cameron Semmens, and is illustrated by Hamish McWilliam. My reflection can be found in Hope with a Cockatiel. The Zoo in You is now available for pre-order for $19.95 plus postage here. Orders will be shipped from 2 December, and should arrive in good time for Christmas. If the God stuff's not your thing, no matter – just wait 'til the next book!